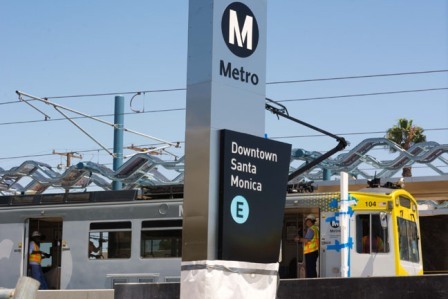 California voters weighed in on tax hike Measure M, and decided that, yes, they will approve of Metropolitan Transit Authority raising over a billion dollars for new projects. Proponents in this city said the much needed hike would create more than 400,000 jobs and new opportunities for Angelenos who need it most. Mayor Eric Garcetti, stomped hard for the measure, visiting black churches like West Angeles, and encouraging his constituents to get out and vote. Supervisor Mark Ridley-Thomas was also a big supporter of the measure. “This is also about jobs, jobs and more jobs,” he said. M is an extension of Measure R, which voters approved in 2008. It is the fourth tax increase to help fund transportation projects here in Los Angeles. The increase will become effective January 1, 2017 and remain in place until voters decide to end it. The measure also calls for regular independent audits to ensure accountability and transparency. Garcetti said that Measure M was about people and their stories like the dilemma faced by an 82-year-old veteran without a public transportation option to get medicine or a South Los Angeles child who never visited the beach. “Now with the Expo Line open to Santa Monica, all that public transportation fulfills the dream that lives within you. It’s the church network that makes sure that we touch the lives of ­individuals,” said Garcetti. “I know many congregations have been impacted by Metro’s construction and expansion efforts,” said Bishop Charles E. Blake of West Angeles at an October breakfast meeting. “But the good news is that we will all reap the benefits of an expanded and more reliable system that relieves traffic.